National building codes require the use of refractory mortar conforming to ASTM C-199 for installing firebrick and clay flue linings in masonry fireplace and chimney construction. 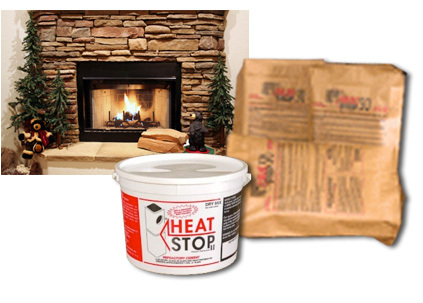 Regular Portland cement based mortar resists temperatures up to about 600 deg. F, but residential fireplaces operate well in excess of 600 deg. 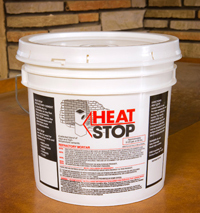 F. Heat Stop resists temperatures above 2000 deg. F, assuring code compliance and a quality installation. Meets ASTM C-199 and all building codes. Ready to use. Just mix. Air-setting Great for laying firebrick in hot dry weather. Water soluble so not appropriate for flues or outdoor fireplaces. Available in 50# buckets or in 10# pails.